Britons celebrate many holidays throughout the year. Six of the British holidays are also the bank holidays. Most businesses and institutions are closed on bank holidays. There are also many holidays celebrated only in Wales, North Ireland, Scotland or England. Let’s take a look at the most popular of traditional British holidays. This day commemorates the crucifixion of Jesus Christ and falls just before Easter Sunday. Good Friday is a public holiday in the UK, and people who regularly attend church, are most likely to attend a special church service on this day. Others will use their day off work to visit friends and family or take short trips. This day commemorates the resurrection of Jesus Christ and it falls right after Easter Sunday. For many people it is the last day of a four-day weekend, and some Britons come back home from short trips on this day. 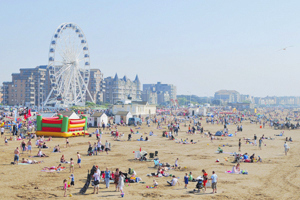 Others enjoy spring weather and watch or take part in egg rolling competitions, special sports matches, Easter bonnet parades and other events. This bank holiday falls on the first Monday on May. In England, Wales and Northern Ireland it is also known as May Day. Events are held to celebrate the start of summer season and the hope for fertility. This day is famous for its dancing traditions. 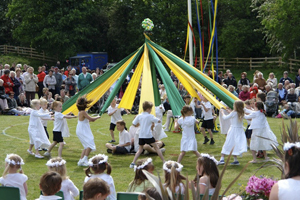 Children, particularly girls engage in maypole dancing, and men dress in white and demonstrate the Morris dance. This holiday also known as late May bank holiday, falls on the last Monday of May. It is the time when Britons have a day off work, take short vacations, organize picnics, catch up with their family and friends and simply relax at home. In some parts of the UK, this day is often associated with special customs. 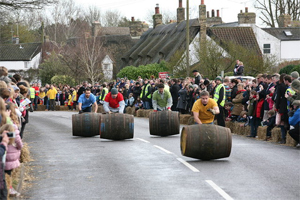 For example, in Cooper's Hill in Brockworth, Gloucestershire, people race down a steep hill chasing a large round cheese to win a Double Gloucester cheese weighing around 3.5kg. In England, Wales and Northern Ireland, the summer bank holiday falls on the last Monday of August, while in Scotland it is on the first Monday of August. This day marks the end of summer holiday for people who come back to work or school. Some people take trips on this three-holiday weekend. Others stay home, work in the gardens and carry out home improvements. The UK remains a largely Christian society and Christmas is widely celebrate throughout the Great Britain. Britons decorate their houses with ivy and holly, hang mistletoes and stockings around the house. People in the UK tend to believe that Christmas is the time for family. They get together, roast turkey with plum pudding and exchange gifts. British children wait for Father Frost on Christmas. In the UK Boxing Day is celebrated on December 26, next day after Christmas. The British mostly spend this day in family circle boxing up old clothes and other things together to give them to the needy. People also like to give money to charities on this day. Giving gifts to postmen and shop clerks is also a tradition of the Boxing Day. On New Year’s Eve (December 31) people usually turn to television to see one of the four clocks on Clock Towers count down the last minutes of the old year. At midnight, as the chimes of Big Ben mark the start of the New Year, people drink champagne and congratulate each other. Some people hold parties at home, others celebrate at pubs and night clubs. People often make New Year resolutions and try to abide by them the whole following year. Generally observed as a conservative nation, the British sure know how to have fun and celebrate. Their traditions are regard as some of the oldest and admired in the world. Some celebrations are so fun, they can get dangerous with all the fireworks and competitions, that’s why it would be wise to take out travel insurance when before going to the UK before a holiday.